The GMC Motorhome Registry began after Dave and Jan Greenberg sold their first GMC in 1985, a Palm Beach, which they bought in late 1975 in New York State. Often wondering where it was over the years, and beginning their search for GMC #2, Dave founded the GMC Motorhome Registry. His goal was to develop and maintain a historical record of the coaches, while tracking changes in ownership for the 12,921 GMC's built between 1973 and 1978. Dave and Jan used their GMC for tail-gate parties and camping, including a one year trip around the 48 states in 1977 with two pre-teens. In 1993 they bought their 2nd GMC, a 1977 Palm Beach with 480,000 miles on it, and they managed to put on an additional 160,000 miles. The 2nd engine, a 455cid, had over 325k miles on it, with one rebuild (Joe Mondello) and 2 valve jobs. Dave began his quest of finding GMC's by lifting hoods and jotting down serial (TZE) numbers. He looked through classifieds, online auctions, club rosters and FMCA. He also recruited help from world-wide GMC owners, and continually gathered information. In the process, he learned of the commercial and military applications for the coaches, the celebrity owners, about up-fitters, equipment changes, and defining the paint codes. Dave also found a community of very loyal owners. The purpose through maintaining this registry is to locate and connect with other GMC owners and to trade anecdotes, ideas, and service or parts supplier information. We are able to record coach modifications and track the movements of coaches from place to place, owner to owner. Since May, 2011, more than 778 additional GMCs have been found, and we will always continue to chase GMC Motorhomes to find all 12,921! There are many web sites dedicated to the preservation and sharing of information about the classic GMC Motorhome and its sister product, the Transmode. We hope that you will find this site useful in connecting with other GMC sites. 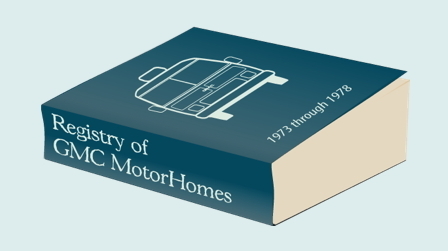 But, our primary goal will always be to locate and account for all of the GMC Motorhomes ever manufactured. We will be adding as many links as we can find relating to GMC Motorhome enthusiasts everywhere! We want to provide links to GMC clubs, GMC repair and service providers, GMC parts suppliers, post photos of GMC Motorhomes and, most of all, communicate with other GMC owners who are our best source of information! GMCers are a small, but loyal community, and are very happy to assist this site in its effort to fulfill the goal of finding ALL of those GMC Motorhomes and Transmodes! Our best source of information is word of mouth, so keep talking about us! The Registry currently has over 8,908 listings since it began in 1993, and it continues to grow at the rate of nearly a hundred per year. Your help in achieving this goal is very much appreciated. Dave is a past member of the Family Motor Coach Association Governing Board, GMC Western States, GMC DixieLanders, GMC Motorhomes International, past president of GMC Sunshine Statesmen and founder of GMC Eastern States. In May of 2011, Dave transferred responsibility for maintaining the GMC Registry to John Shotwell (with 8,076 coaches). John will continue to build on the legacy that Dave has developed over the course of the Registry's history. By way of introduction, my wife and I purchased our 1978 GMC Royale in December of 2006 from a couple in Santa Fe, New Mexico. We have used it for many trips and enjoy the camaraderie we have found with all of the other GMC owners we have met. We are currently members of GMC Motorhomes International, GMC Dixielanders, GMC Great Lakers, GMC Eastern States, and FMCA. In November 2018, the database was transferred to Billy Massey (with 8,908 records) for administration and safekeeping. I've been deeply involved with the community since 1998 prior to purchasing our first and current 1976 Palm Beach, lovingly known as Sweet Pea. I also created and admin 4 other GMC devoted web sites and 2 very active GMC Facebook groups. See the Links page for more information on those. My wife, Debbie, and I are members of every GMC Motorhome Club in the country as well as FMCA. We plan to be a part of this awesome community for as long as we live. There is no charge or fee for this service ... it is our contribution to the GMC Motorhome Community. Finally, the registry information is held confidential and is not bartered, rented, leased, traded or sold.